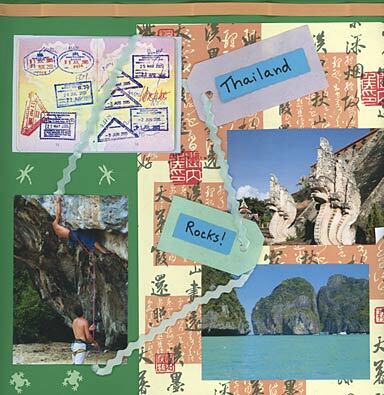 On this layout I tied some HMA Creative ribbon through and across my images - the photos of Thailand plus one seriously stamped passport. I also dug out a couple of EK Success punches - 'dragonfly' and 'frog' because I'd been wondering where to use them. I picked up this rather attractive oriental paper at London's Big Stamp and Scrapbooking Show. To my shame I didn't remember the supplier's name as I was emptying my over-filled bag of stash on the kitchen table. Chatterbox do some oriental paper, as do others but when I revisit the show in March, I will be on the lookout for the same design.